I chose to mount the bottle in place of the rear seat. Find a suitable place to mount your bottle, make sure you have enough line to reach the nitrous solenoid. I simply removed one of the covers that are beneath the rear seats, drilled 4 holes and mounted the brackets for the bottle. Drill a hole through the floor, large enough to feed the line through. Use a rubber grommet to insulate the line against the metal of the floorpan. Make sure the hole will line up with the top of the bottle... measure twice and drill once! 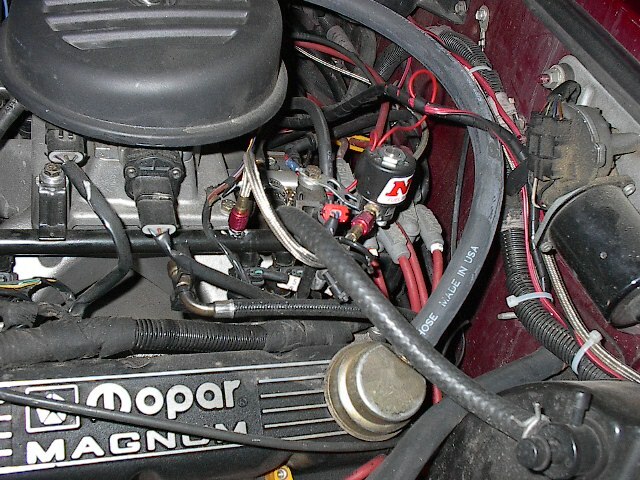 Run the supply line up the frame rail and into the engine compartment. 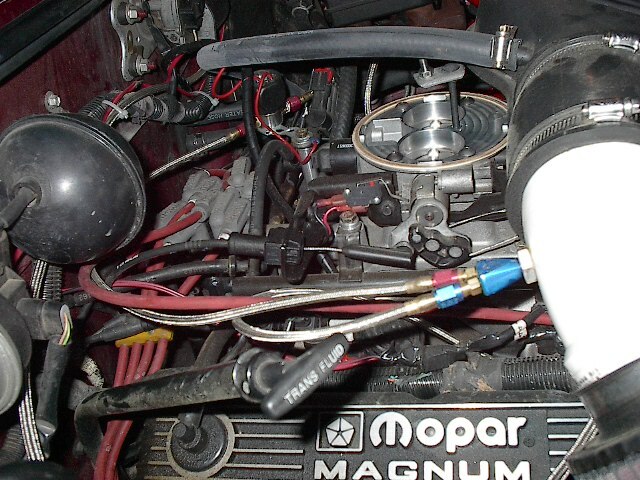 ***tip*** Tightly wrap some electrical tape around the ends of the nitrous line so that you don't get any debris in the line which can plug the solenoid. Run the line up from the frame rail, make sure that it is clear of the usual hot/sharp/moving objects. Secure it along the firewall with whatever, I used wire ties, would look better using some line clamps. Now is a good time to mount the solenoids. I chose to use the mounting bolts that hold the fuel rails down, although this might not be a choice with the stock manifold. 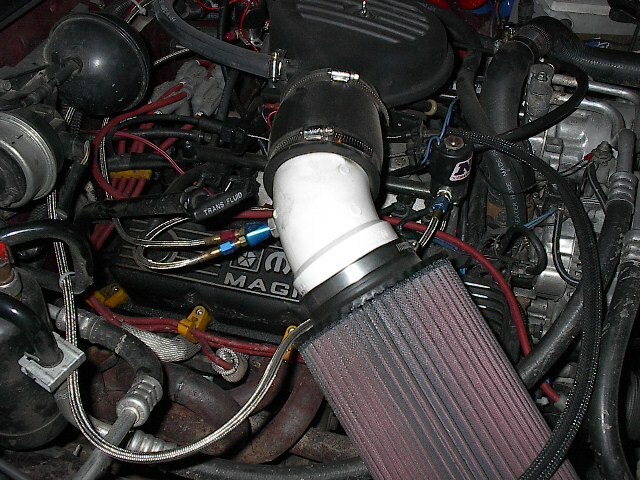 Make sure wherever you mount them that you have enough line to run from the supply line, the fuel line to the fuel rail test port, and back to the nozzle in the intake stream. 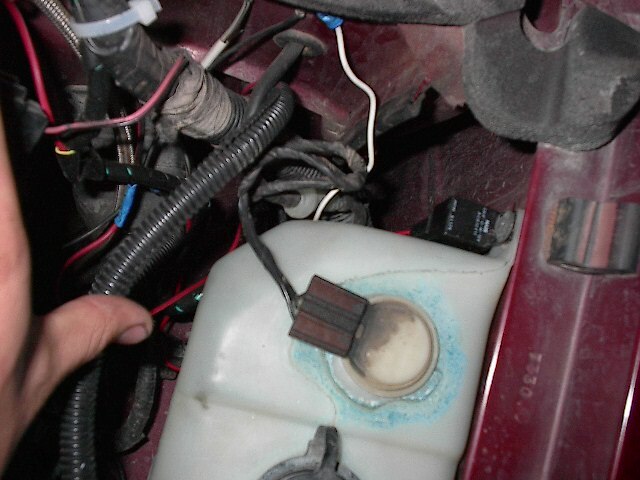 Remove the schrader valve from the fuel rail test port, and install the fuel supply line to the fuel solenoid. Make sure to use a teflon based paste thread sealer. 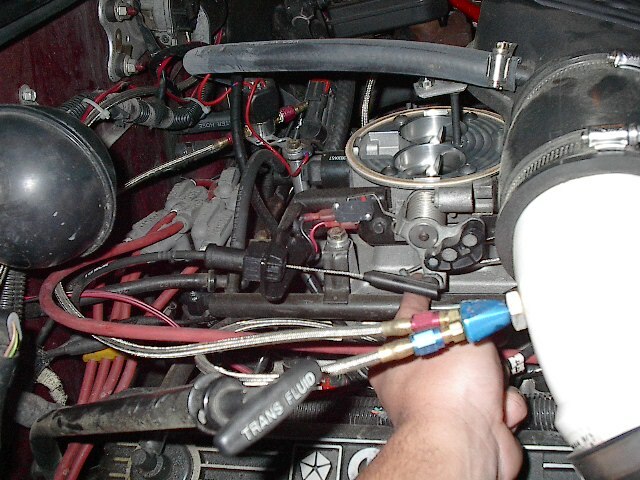 Then run the fuel line from the solenoid to the nozzle. 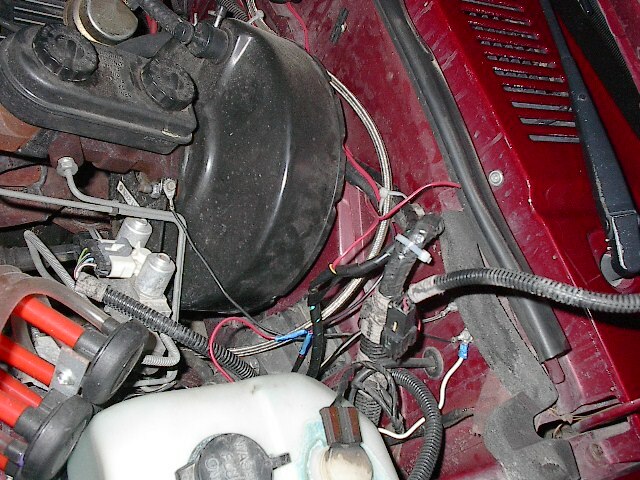 Attach the nitrous supply line to the nitrous solenoid, and run the line from the solenoid to the nozzle. Again, use the paste thread sealant. If you have not mounted the nozzle, do so before attaching the lines to it. Mounting the nozzle is done by simply drilling a hold slightly smaller than the diameter of the nozzle, and threading it in. This Nitrous Express kit uses a locknut on the inside of the tube, make sure to use thread locker on it! I strongly recommend taking the extra time to install your kit in a similar fashion. Install the WOT switch on the TB as shown, it will take some trial and error fitting to make it just right, and you'll need to 'adjust' the lever on the switch itself. Install the saftey switch in an accessable place, easy to reach from the driver's seat. 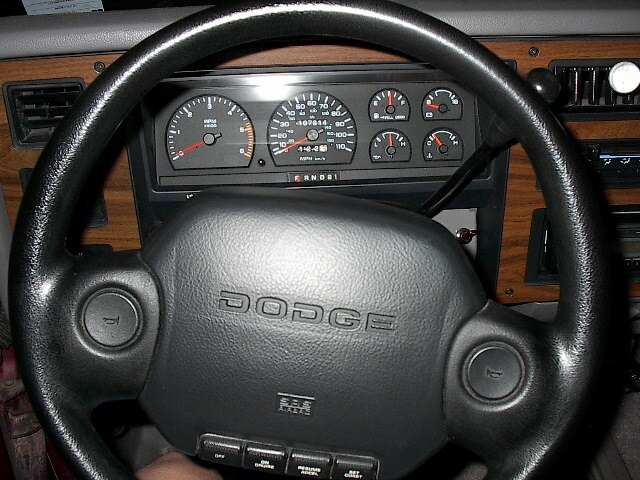 I chose the area just to the right of the ignition switch. A lighted switch is nice, so that you'll have a second visual reminder of when the system is armed. Now you'll need to wire in the relay. The relay needs to be somewhat sheltered from dirt, heat, and expecially moisture. I chose to use one of the mounting screws on the washer reservoir so that I wouldn't have to drill another hole. Now it's time to wire it all up. Begin by running a 12v+ wire from a switched (ign key on) source, to the saftey switch that you mounted in the cab. For a lighted switch you'll need to run a ground wire from the switch. Then run a wire from the safety switch to the WOT switch. Now run a wire from the other terminal of the WOT switch to the relay. It does not matter which terminal you use on the WOT switch. To wire in the relay, you'll pretty much follow the directions supplied with the relay. Basically the relay will have 4 terminals: a ground, power in, power out, and a signal input. This should be self-explanatory, but the power in terminal should be connected to the battery (use at least 12ga wire, preferably 10ga). Power out will run seperate wires to each solenoid, as well as to the MSD box for timing retard and/or secondary rev limiters. The signal input will come from the WOT switch, and the ground runs to a GOOD ground, preferablly a direct connection to the battery but at least to a solid bare body panel. 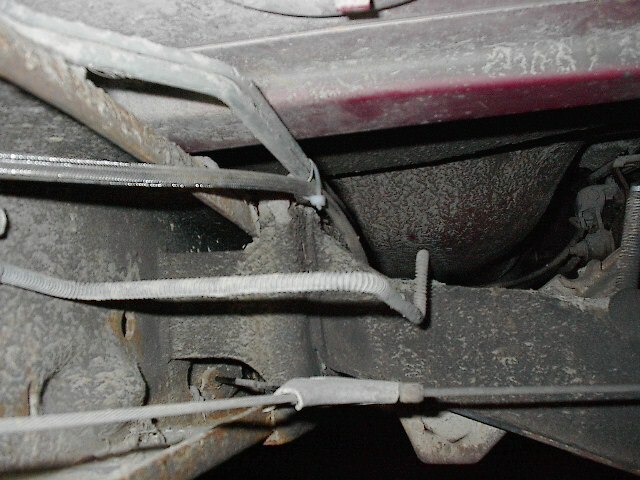 Lastly, connect the ground wires from each solenoid to a good grounding point. Once you're done, double check EVERYTHING. 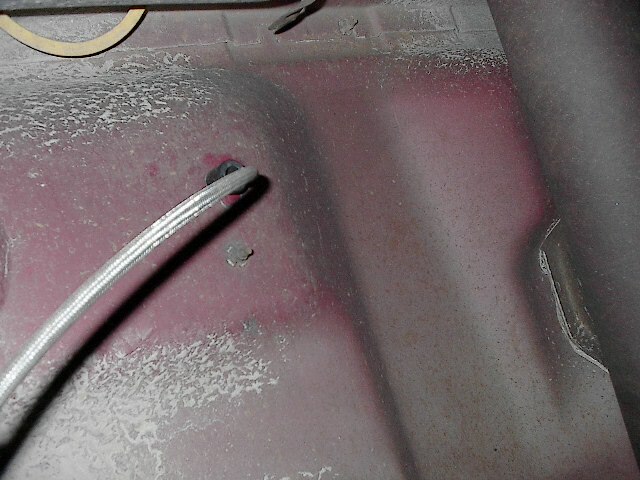 Start the truck and make sure the fuel lines are not leaking. Do not open the nitrous bottle yet! 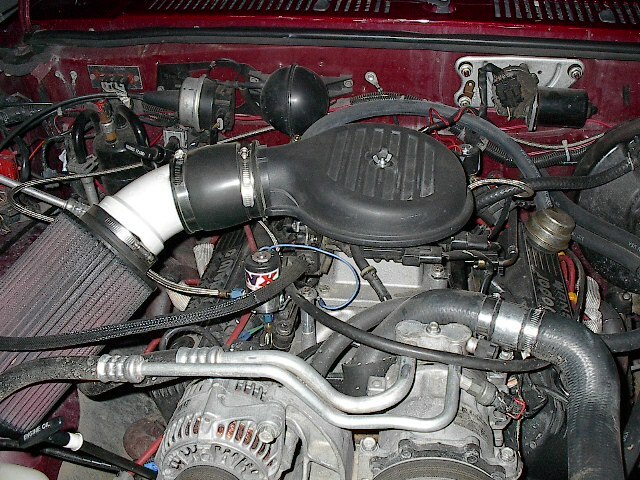 Install the nitrous and fuel jets and take the truck for a sping... again, do NOT turn on the bottle. Find a good place to test the system (nitrous bottle CLOSED) you're hopefully going to feel the truck fall on it's face when you hit the switch. Since the bottle is CLOSED, the fuel soldnoid will be dumping tons of fuel in the motor... this is testing to make sure that you do indeed have fuel delivery.